The Taj Holiday Village stands out in a sea of Goan resorts, striking a balance between modern convenience and timeless beauty. Follow quaint stone pathways from your detached accommodation to the shimmering waters of the Arabian Sea, pausing under a dense palm tree canopy. 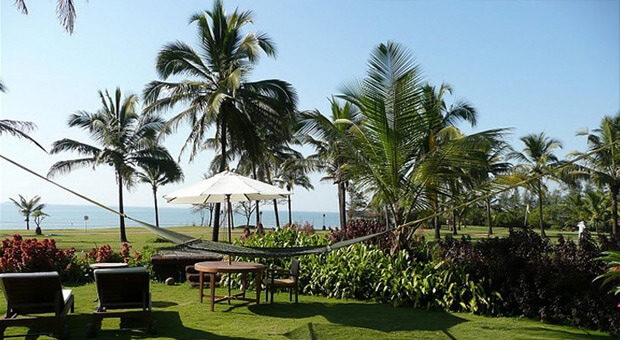 Sure, the facilities at Taj Holiday Village are superb, but to truly appreciate this Goan resort, it's best to pretend they don't exist at all (at least until your next spa appointment). Goa's Portuguese past is evinced in the unique architecture of The Taj Holiday Village's garden cottages and luxury villas: Doric columns support clay roofs, while peaked windows peer out from below. Cozy accommodations range in size from 235 to 560 sq. ft. and contain LCD TVs, DVD players, and newly designed bathrooms with tubs. Interiors follow a tropical motif. A total of six restaurants and bars are on-site. The authentic Thai cuisine of Banyan Tree (named after the 300-year-old giant it sits under) is a particular favorite among epicurean guests. Meanwhile, Jiva Spa rejuvenates with traditional Indian techniques. Home to innumerable resorts and 70 miles of pristine Arabian Sea beachfront, Goa is one of India's most popular tourist destinations. Taj Holiday Village is located one hour from the airport.